The recesses during grade school in the fall were spent collecting acorns from a big oak tree in the corner of the playground. 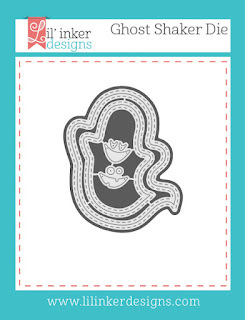 My friends and I had oodles of them. 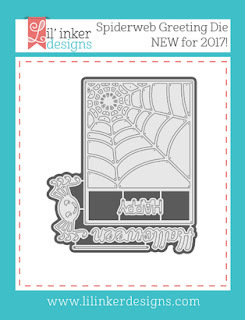 We'd pop some open, we'd take the caps off some, we'd make designs. 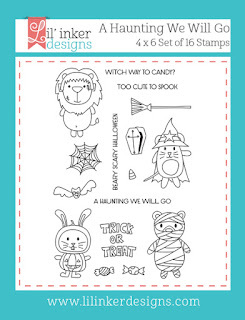 All sorts of fun, I guess! 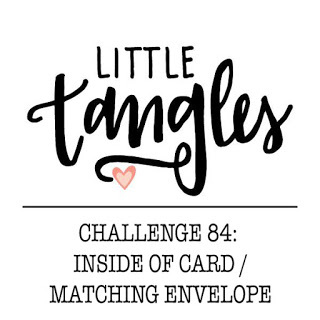 I'm playing along with the Little Tangles Challenge 84: Inside of Card/Matching Envelope. For the front of my card, I stamped and colored with pencils last year's Neat & Tangled and Simon Says Stamp collaboration, Nuts About You. 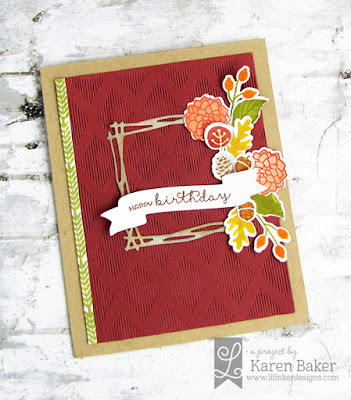 I used the banner in Big Top Birthday to make a plaid design as an accent for the side of the card. I tied the cap of the acorn with some twine and then added some Nuvo Drops. The sentiment is from Better Together. 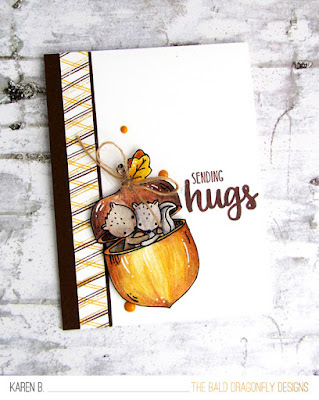 I chose to decorate the inside the card, adding small strips of the brown cardstock and custom plaid paper from the outside, as well as an envelope from Nuts About You and a sentiment from Better Together. There is always a rush when you find out you have been invited to participate in a well known, well respected and absolutely fun challenge, and being asked to guest design for the Ellen Hutson's September PinSights Challenge was no exception. 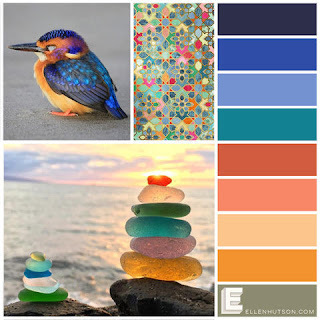 Isn't the inspiration collage just amazing? My first card (above) utilizes the top and bottom spectrum of the colors showcases. 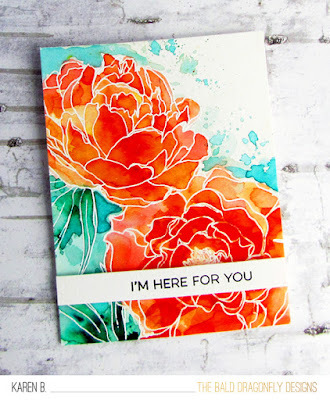 It features the absolutely beautiful Essentials by Ellen Mondo Peony by Julie Ebersole stamped and masked, and heat embossed with Wow Embossing Powder Bright White onto watercolor paper. 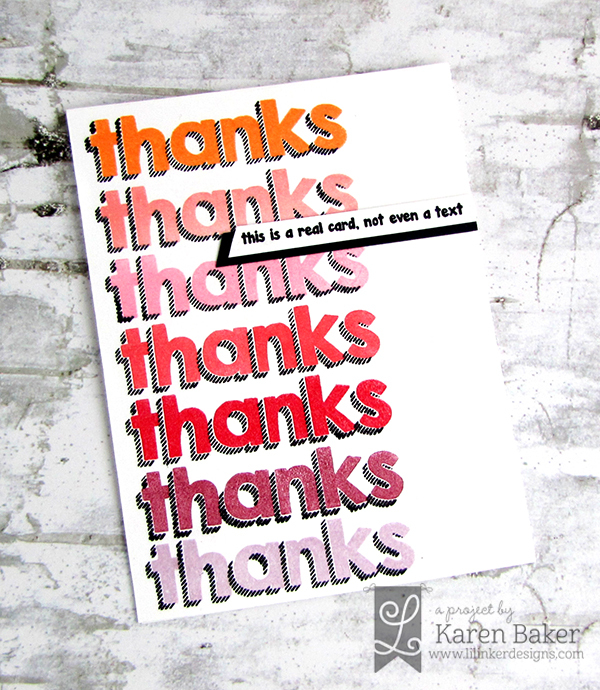 I then used Ken Oliver Color Burst, Burnt Orange and Ranger Distress Ink Lucky Clover to watercolor the images. 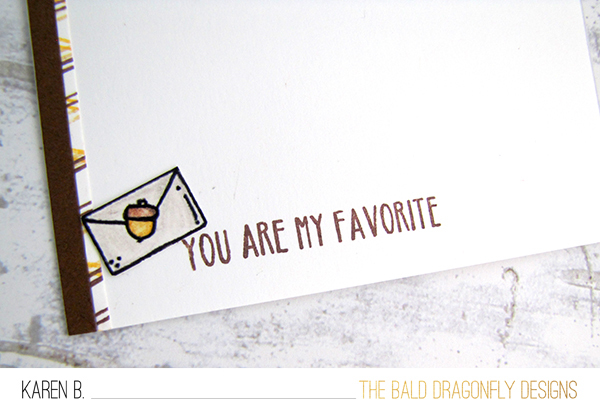 I added a sentiment strip, from My Favorite Things More Essential Sentiments. My second card features the full color spectrum from the inspirational photo. 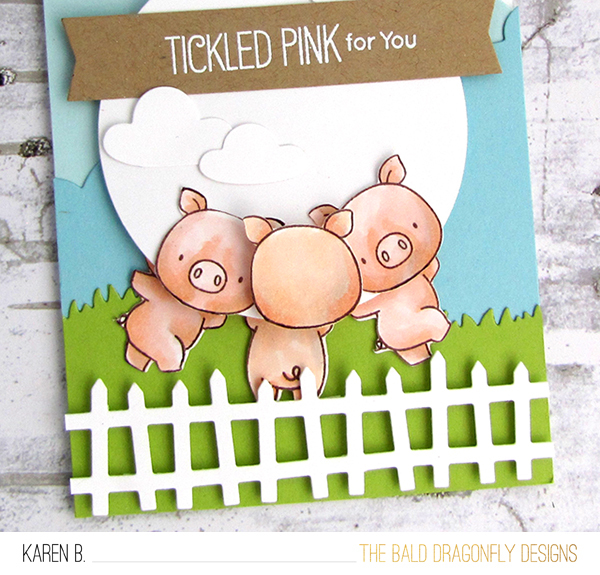 I used many of the same supplies, with the background made from Distress Inks. 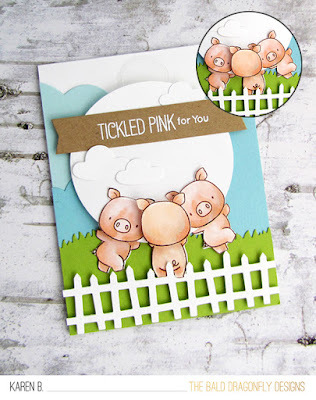 It was so much fun to be inspired by the PinSights Inspiration photo. 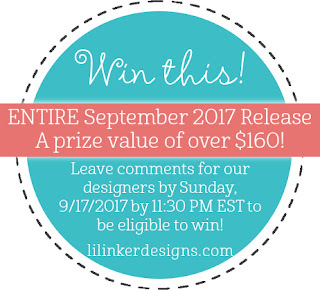 I hope you have a chance to play along! 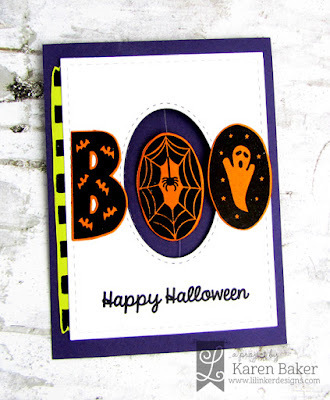 I think all of us had had the situation where we were asked to make a custom card, but have hardly any time to make one? 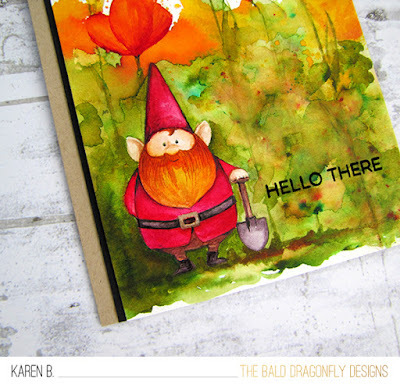 That was the case with this card, please head on over to the Where Creativity Meets C9 Challenge Blog to find out how my son and I created this card, with the latest challenge: Challenge 13: Ink Only in mind. There's still time to play, you have until September 29th and we'd really love to see your amazing projects featuring Concord & 9th products! 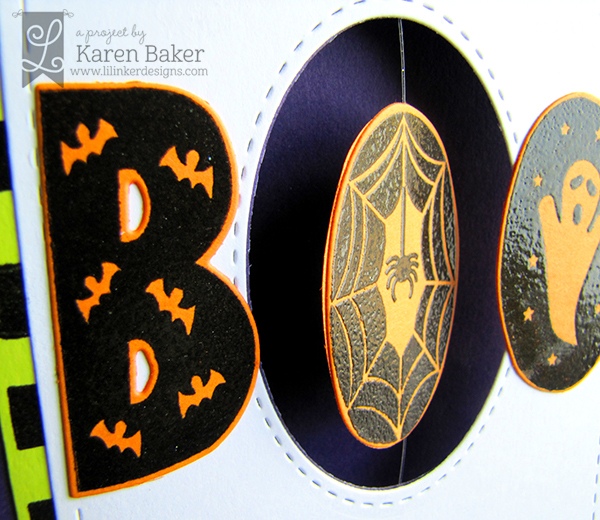 With clean and simple cards, there is not much room for error. Everything has to be spot-on. 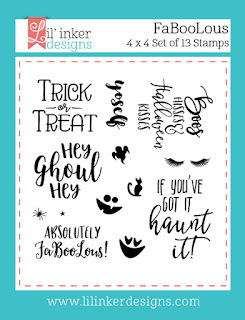 What pressure, right? 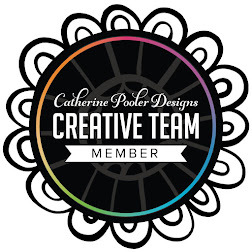 But I love to create them. 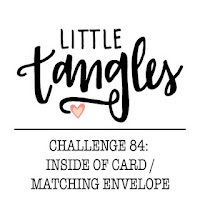 The challenge is there each and every time. 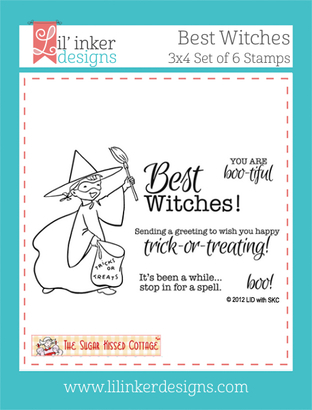 I created this card for the My Favorite Things 2017 Card Design Superstar -Clean and Simple Genius Category. 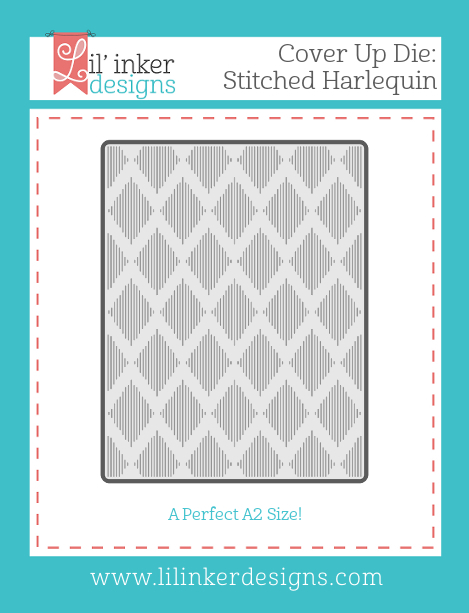 I started with a lovely, neutral card base of Sno-Cone Cardstock, something other than the standard white. I have this thing for stacked animals, I think they are rather cute, and the faces on these kitties from Cool Cat just seem to say "stack me." 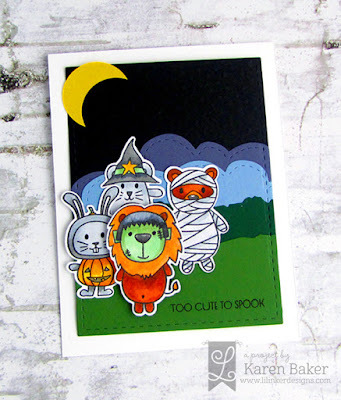 I stamped and masked, then colored with Copics and fussy cut the cat teepee out. 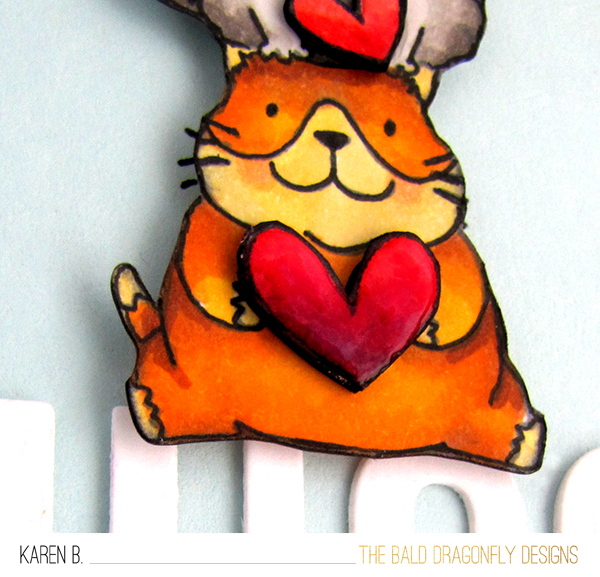 They each got a glossy heart affixed to them Beast Friends and Top Dog (retired)). 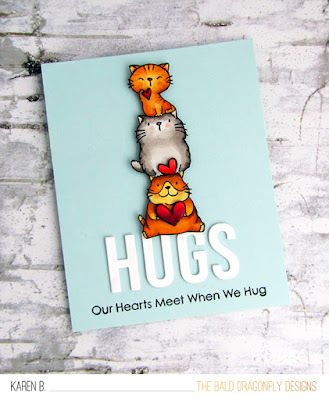 I finished the card with a "Hugs" from the layered Twice the Hugs Die-namics and a stamped sentiment from Lots of Hugs Stamp Set. 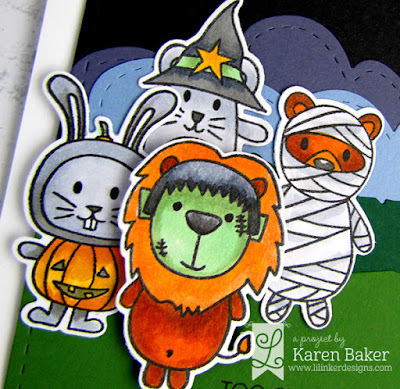 There are so many expert artists out there that inspire me daily. I ooh and aah and study all the amazing creations. 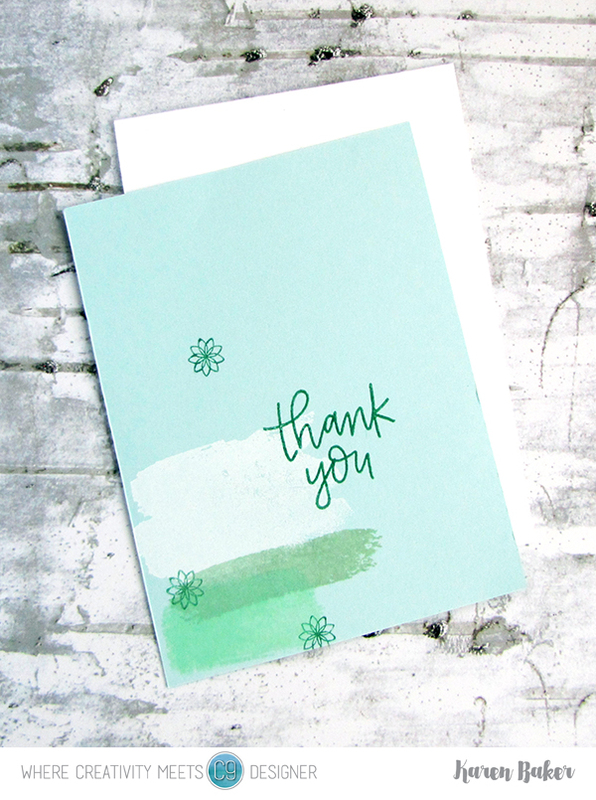 I appreciate all forms of coloring, from colored pencils, to markers, to watercolor. 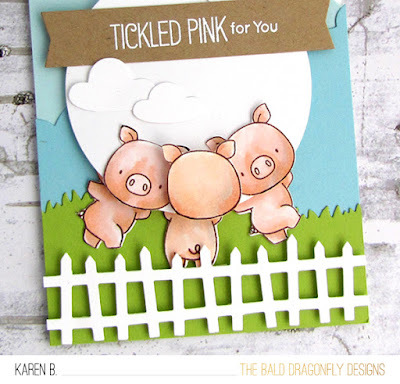 This card is for the My Favorite Things 2017 Card Design Superstar Challenge-Coloring Virtuoso. 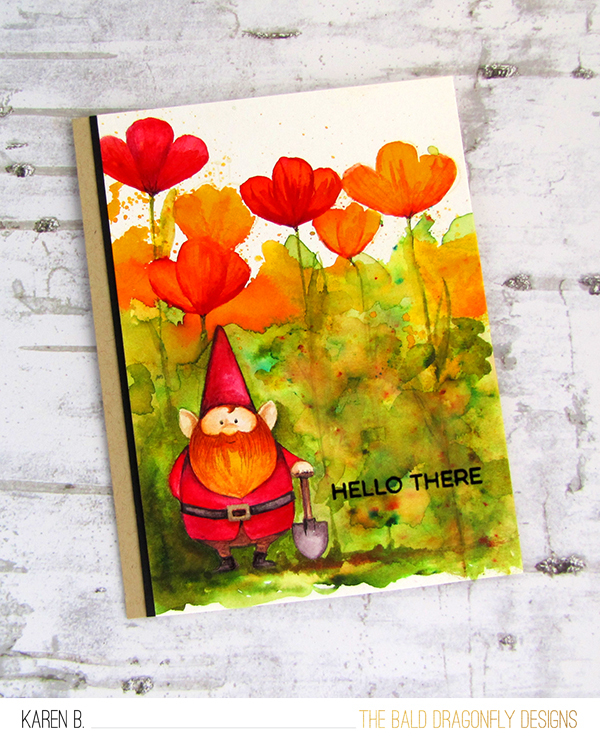 I did some no-line watercoliring with one of the cuties from You Gnome Me. 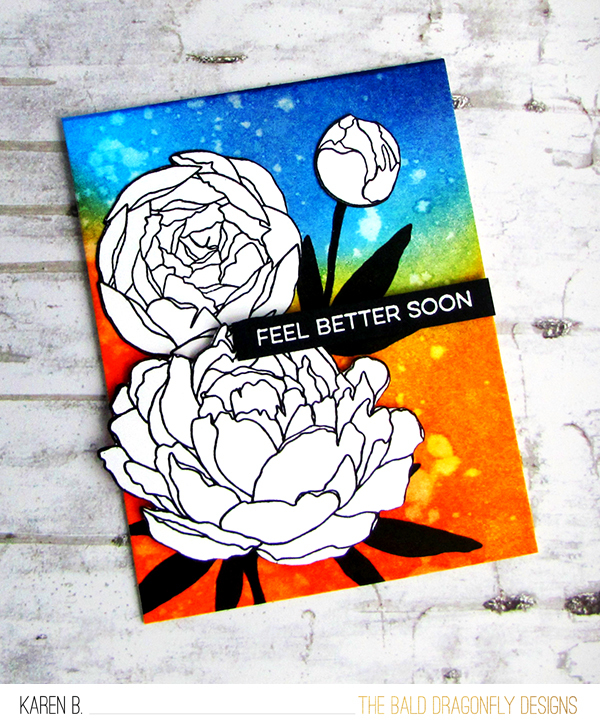 I then added some light stamping with flowers from Sketched Flowers in the background, starting with loose watercoloring on the bottom and ended up with detailed flowers toward the sky. 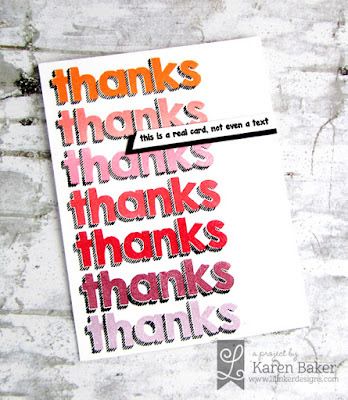 I finished the card with a sentiment from More Essential Sentiments. 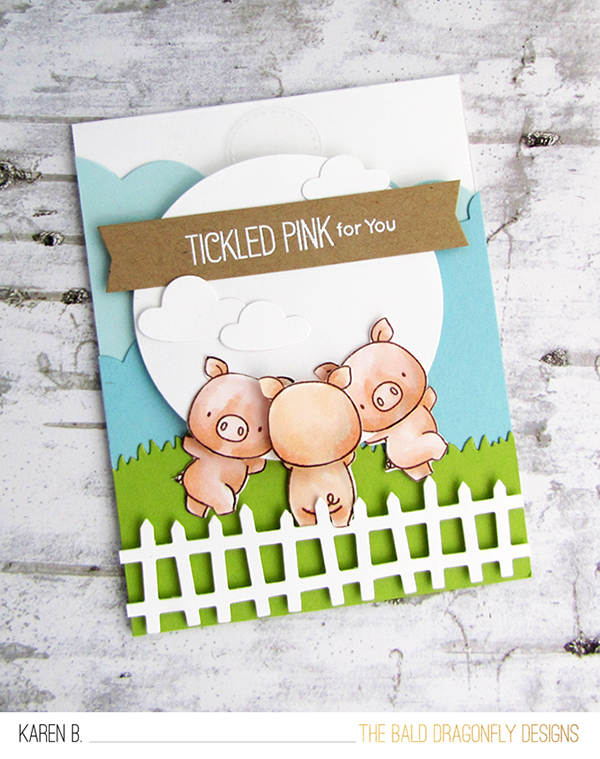 This card was a labor of love, I had to work in small areas at a time, to allow the paint to dry. I used a mixture of traditional watercolors and Color Bursts. Today I have a card for the 2017 Card Design Superstar Innovation Master Challenge. 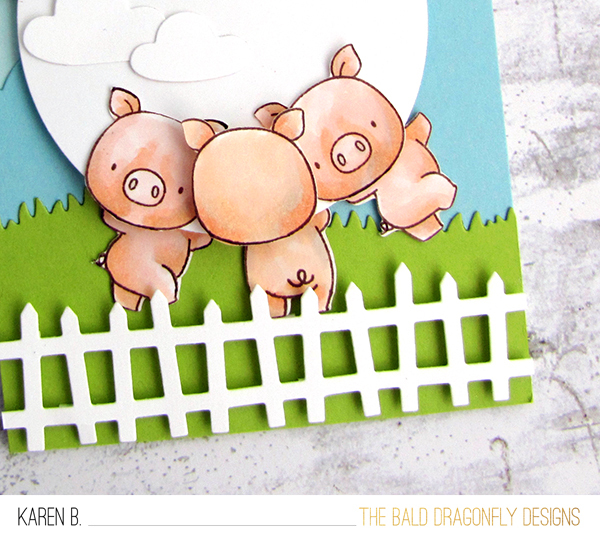 These little dancing piggies from Hog Heaven dance around after hearing someone's good news. 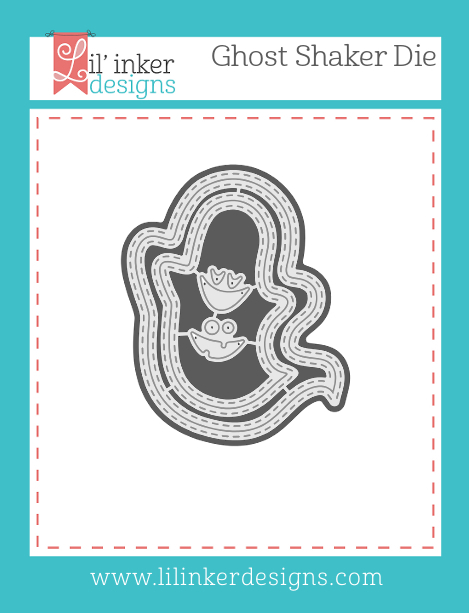 There is an acetate tab (Stitched Tiny Tags Die-Namics) on the top of the circle that can be moved back and forth to make their bottoms wiggle and jive. They are set in a field of a picket fence in a farm field, with lovely clouds in the sky (Seaside Seagulls Die-Namics, Frightful Fence-retired, Grassy Hills and Ocean Waves Die-Namics). 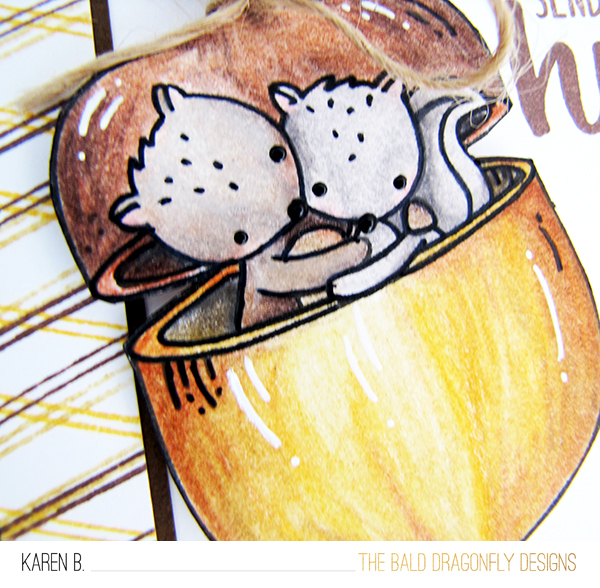 I've also attempted a super short video to show these little guys in their dancing glory...hopefully you can view it otherwise it is up on my Instagram! 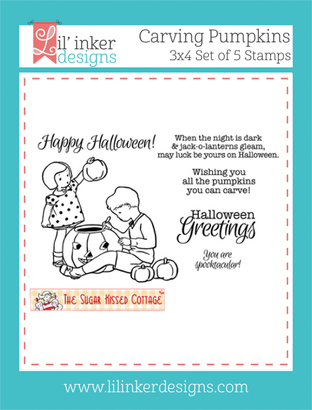 My first card showcases a stamp set that is versatile all year round, and perfectly full of snarky, very usable and fabulous sentiments! 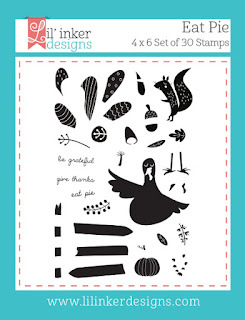 Snarky Shadow Thanks is a must have, awesome and easy to line-up multi-step stamp set. 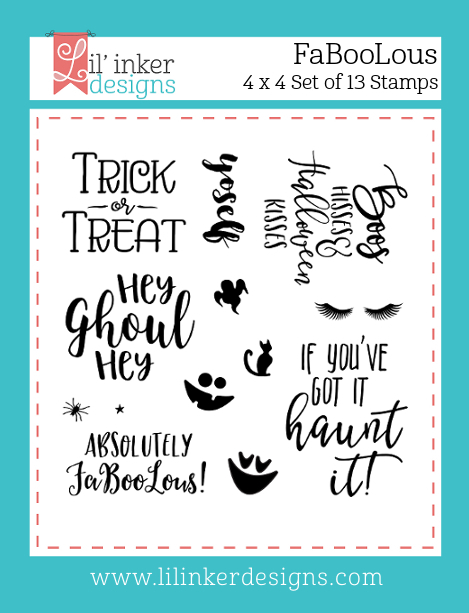 Here I lined up the solid word and stamped it in a row in multiple inks, then came back with the shadow stamp and stamped that with black. 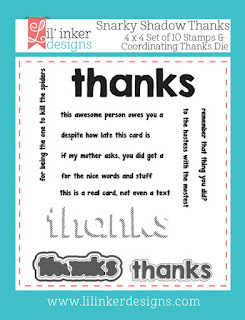 I finished with a coordinating sentiment strip. Easy, but packs a punch. 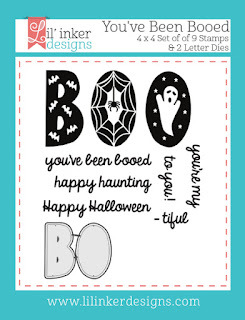 Seriously, these sentiments in this set are a ton of fun! 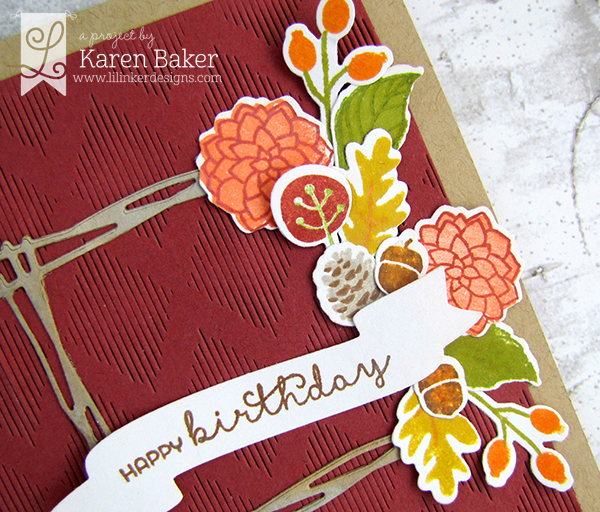 This next card reminds me of fall and all the beautiful colors and textures that season brings. 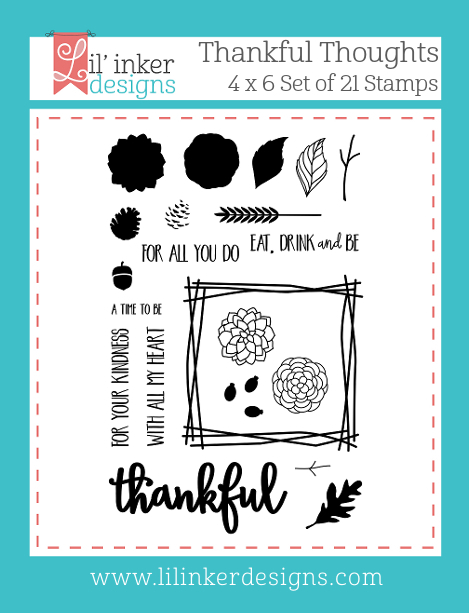 I pulled out the new Quilted Stitched Harlequin Cover Up Die to create a rich, textured background for the beautiful wreath and fall floral arrangement stamped and die-cut from the versatile Thankful Thoughts Stamp Set and coordinating Thankful Thoughts Dies. 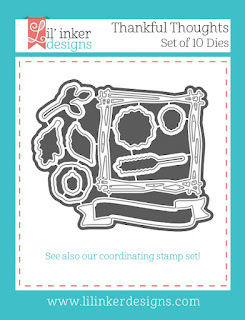 I adore the square wreath in this stamp and die set, along with all the multi-step stamping foliage that goes with it. (I LOVE that lil' pinecone!!) There are beautiful sentiments in the Thankful Thoughts Stamp Set, but I chose to use a sentiment from the previously released Best Blooms Stamp Set, as the banner included in the Thankful Thoughts Dies is so versatile to use almost with any sentiment! I finished the card with a stamped border from the wheat in the Thankful Thoughts Stamp Set. 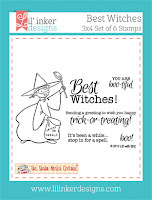 Also, just in time for your Halloween and Thanksgiving Holiday crafting, Laura has brought back the Ghostie Witch Stamps, Best Witches Stamps, Carving Pumpkins Stamps and Thanksgiving Wishes stamps for a limited time! 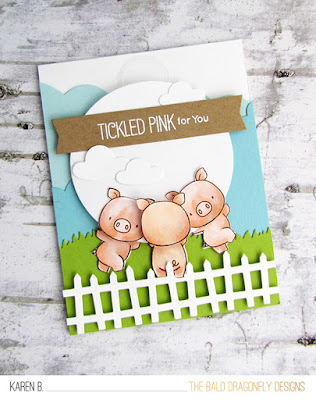 It is with pleasure that I get to send you to the talented Lisa Henke's Blog as the next stop along the hop. 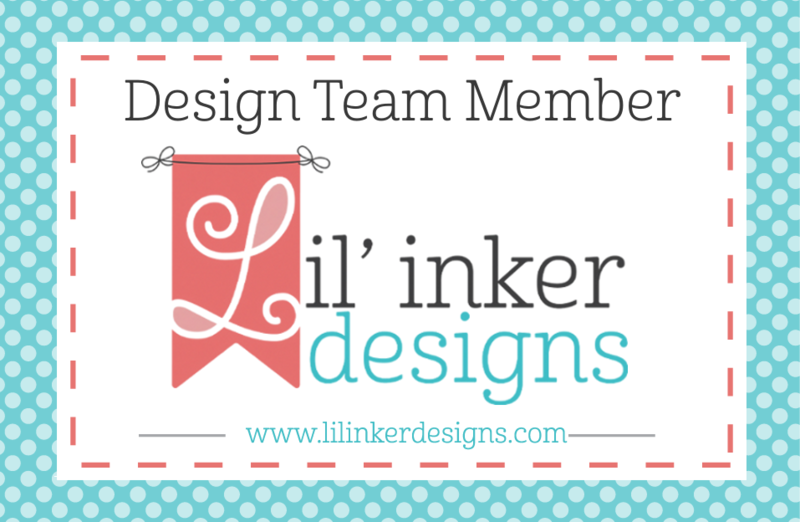 I hope you get a chance to visit the Lil' Inker Design Store now as all the NEW SEPTEMBER 2017 RELEASE products are already up at the store!! Don't forget to leave a unique comment along the each of the stops on the hop! Laura, the amazing owner, has decided to graciously giveaway the ENTIRE release to one lucky commenter! 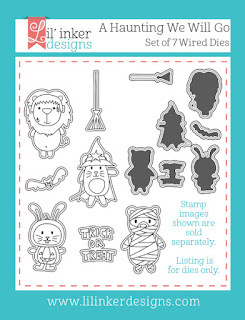 (Details are in the image). My first project features a set that is perfect for fall, perfect for critter-loving friends, perfect for easy multi-step stamping lovers, perfect for just about everyone! 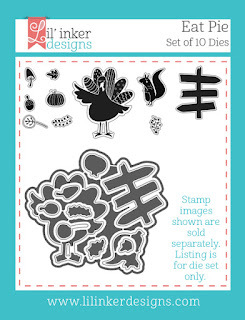 I decided to focus on the super cute squirrel in the Eat Pie Stamp Set and Eat Pie Die Set. 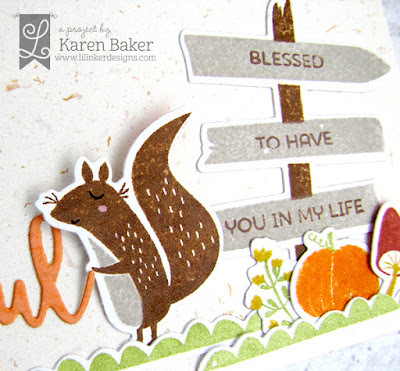 I started by stamping the squirrel, foliage, mushroom, pumpkin and the signage from Eat Pie onto white cardstock and then die cutting them with the corresponding dies. 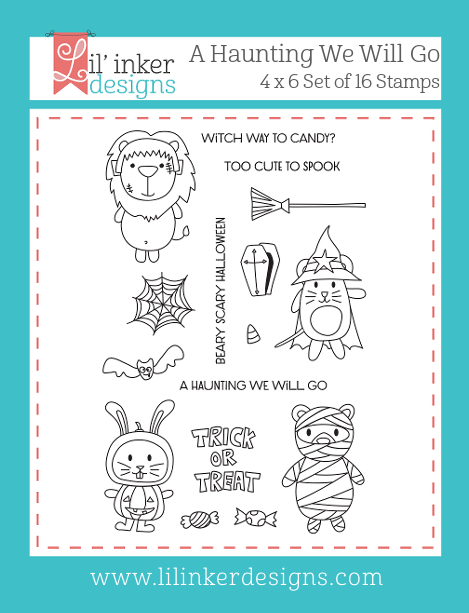 So easy to line up! I then created a simple scene by adding some sentiments from an older set, Best Blooms, onto the sign, and grounded the grouping with some "grass" from Hello Dino, also a previously released set. 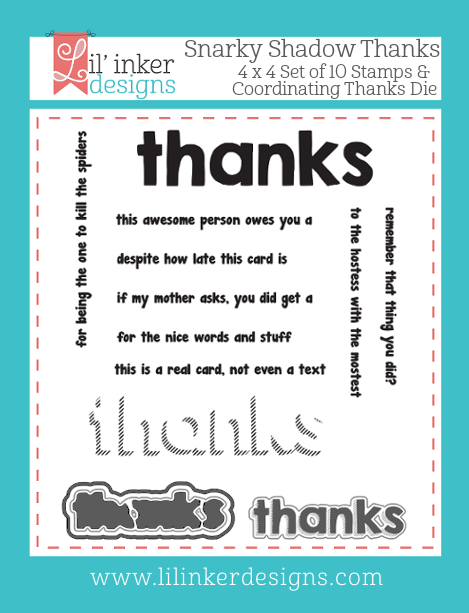 I finished by adding a die cut sentiment from the beautiful, new Thankful Word Die. 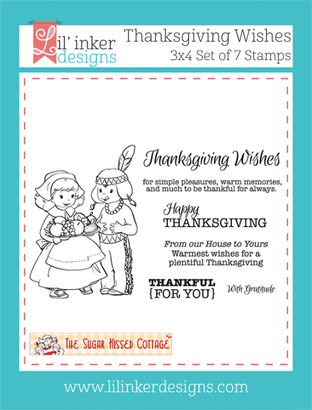 My teammates have fabulous examples of the super sweet multi-step stamping turkey in this set, I hope you get a chance to check their projects out. 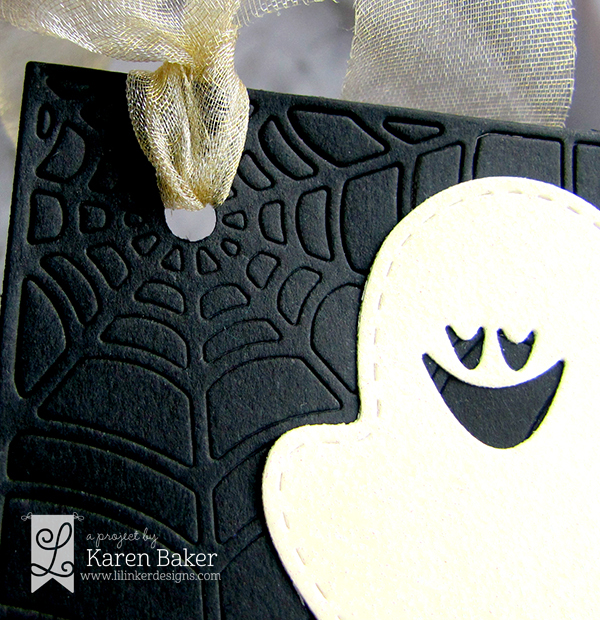 This next sweet little tag was made using the Ghost Shaker Die, Faboolous Stamps, and the redesigned Spiderweb Greeting Die, and couldn't be easier to pull together. 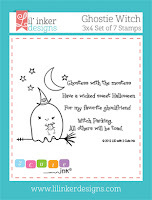 The Ghost Shaker Die is perfect for creating shakers, or, split the dies apart for a super cute single ghost with interior stitching. 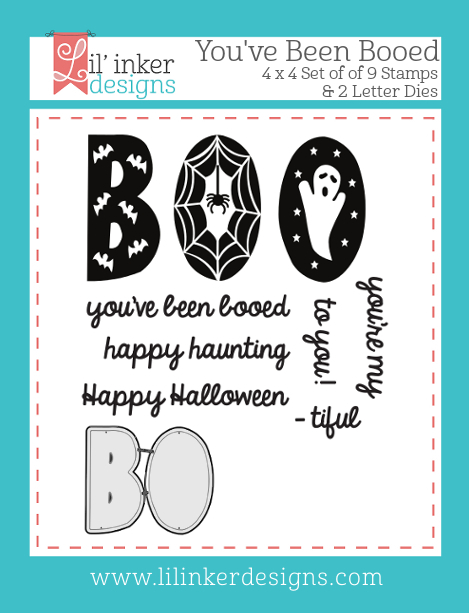 I cut him out of cream glitter paper and die cut out a cut face with the same die set. I created the background tag with the re-released, re-designed Spiderweb Greeting Die and stamped and heat embossed a fun sentiment with the Faboolous Stamps. A ribbon tie finished the tag off. I die cut a window for the middle "o" with the Stitched Mats: Ovals and then sandwiched some fishing line between the two letters when adhering them together. Also used in this card was the ever versatile Stitched Mats: Rectangles. 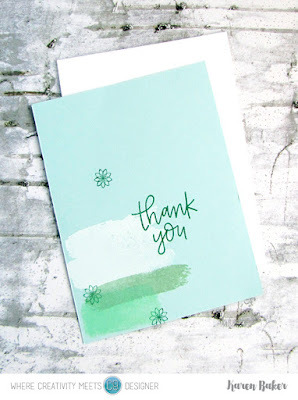 Additional details on the card include the green strip, made from the post sign from the new Eat Pie Stamp Set which I will feature in a future post. My next card features all the cuteness of Halloween! 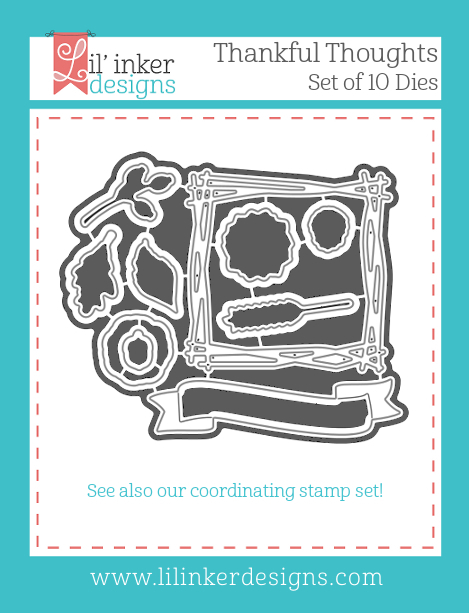 I created a scene with a few older Lil' Inker Designs items like the Stitched Mats: Rectangles and Border Builders Die Set for the clouds and Deco Edge Border Dies for the grass. 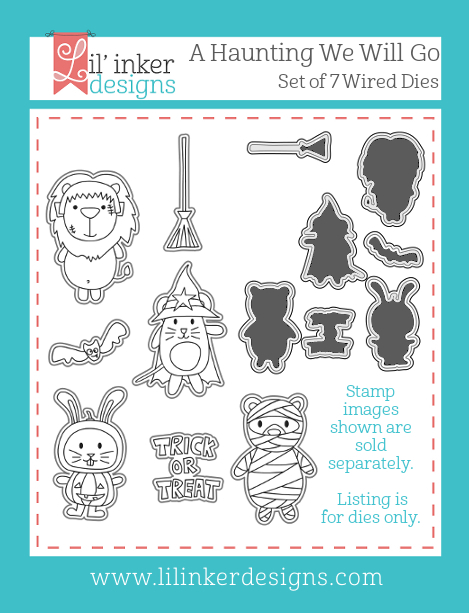 Then, I stamped and die cut each of the absolutely adorable costumed critters from the newly released A Haunting We Will Go Stamps and A Haunting We Will Go Dies. 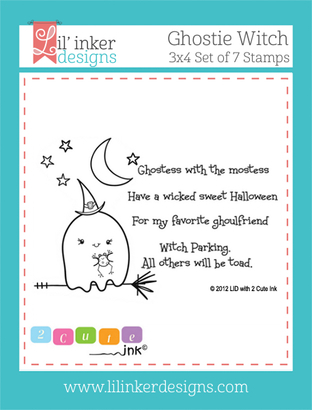 These lil' guys are so easy to color with any medium, and are sure to make any person smile! 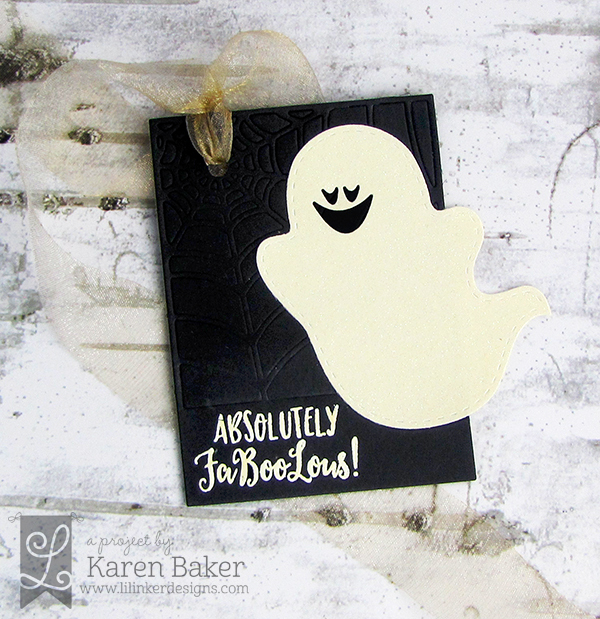 I finished by stamping one of the many cute sentiments from A Haunting We Will Go Stamps.